The GCEC current membership totals 200+ university-based entrepreneurship centers ranging in age from well established and nationally ranked to new and emerging centers. Each year a global conference is held on the campus of an GCEC member school. 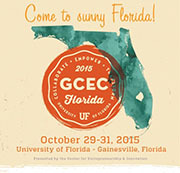 The 2015 GCEC Conference will be hosted by the University of Florida, October 29-31, 2015. Click on the following link to access the conference website to register: http://www.gcec2015.com.